How Can You Use 3D and Life Sized Product Displays Grab More Attention? Grab the attention of your audience by using full-color displays, murals, and dimensional/custom shaped signs. Effectively placed signs can justify a great return-on-investment, as they don’t take vacations or lunch breaks. Full color printing provides you with a limitless amount of options and possibilities to display something interesting. Creative ideas include life-sized infographics & informative charts, company mascots (Geico Gecko), Over-sized pictures of your products (commonly seen in Market Basket), and unique lighting displays. Who hasn’t seen the Chick-Fil-A “eat more chicken” Cow display at the mall?…This is a basic example of how branding and marketing strategy are used together to effectively get a business noticed and remembered. 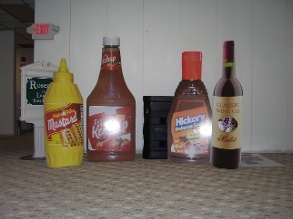 The oversized condiment bottles above were used by one of our customers for a tradeshow display to show the durability of flooring against stains from these types of products. Talk about getting the message out! Who wouldn’t stop to see what this was about? How else might you use full-color graphics in your POP or tradeshow displays to showcase your product? 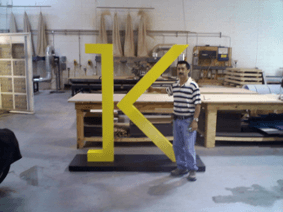 The life-sized letter “K” is a great example of using 3D to create interest. This is the client’s logo. It also uses the < of the K as part of it’s marketing. This was fabricated for a client to bring to a company meeting. The beauty of this design was that the client could use this both as a “K” for their company name, and for a minus sign when disassembled for their logo. For this project we also created a “crate” to ship the sign back to London. Using durable MDF for fabrication, and making it modular makes this a display that can be used in many ways. Placed at the entry to the client’s conference, this generated lots of interest and excitement about the event for the attendees. How Can You Use Your Walls to Brand Your Company, Sell Your Products and Attract More Customers? 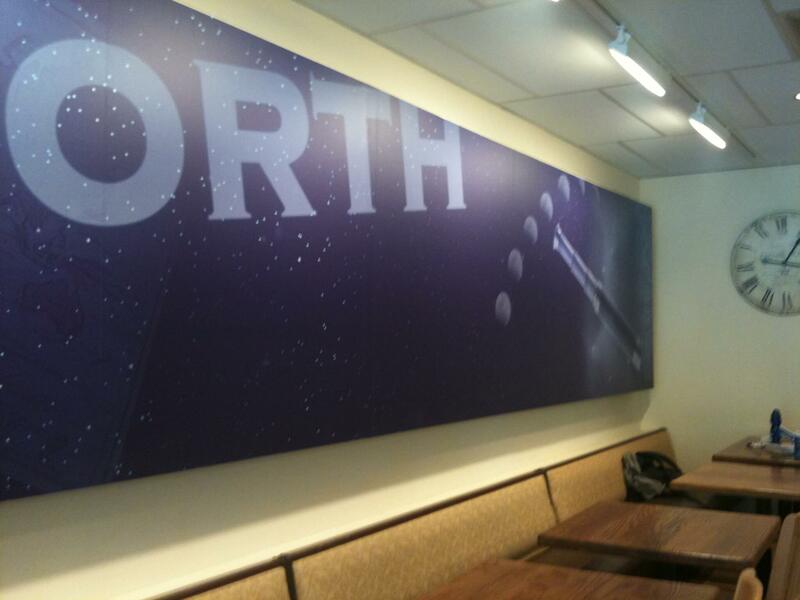 For our client True North Coffee, the client’s contractor built a lighted backer panel inside their coffee shop. The panel was made of MDF with fluorescent lighting behind. Using digitally printed graphics on adhesive vinyl, we then covered in a full-color graphic of their Compass Rose logo adding a branding image while filling an otherwise empty wall. Full color murals can be printed on adhesive vinyl, wallpaper or even fabrics. Check out our Project page for Pita Restaurant to learn how we used Wall Murals and a Dimensional Pi symbol to carry their branding throughout the restaurant and tell their Branding Story. 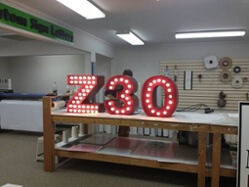 We recently created an “Old School” style set of illuminated marquee letters for Zagat’s at a local restaurant event. These letters create the excitement of the old style of movie or theater marquee letters. For these, we used cool burning, low voltage LED light bulbs. The channel letters were freestanding and had DC wall plugs. How Can We Help You Use Your Displays to Generate More Sales? These are just a few examples of using full color graphics, dimensional signs, and freestanding logos and signs to create interest at an event or in your store or shop. We have done many other similar projects and would love to help you with your sign design or sign fabrication. Custom signs are one of the best parts about our job & industry, and we are glad to help you brainstorm and develop your ideas into a visually amazing and effective display that will get you noticed. Give us a call today and we will be happy to talk to you about wall murals, dimensional signage, freestanding graphics, and full color signs!